A rare timber bamboo species in the United States. The limited stock is currently flowering and a few have produced large, viable seeds after hand-pollinating. These seeds were directly collected from the positively identified species, not from eBay or other unreliable seed source. They were germinated and the seedlings are vigorous. We won't know for a couple of years if these seedlings will develop the typical features of the species (especially the large culms that age to a burnt reddish color). Edible shoots and good quality construction timber. Min USDA zone: 9b. Click to find your zone. Described as the largest bamboo in the world (largest culm diameter). The species is most know for its almost grotesque, tortured-looking culms. The culms grow in a contorted, curving form that resemble an elephant's trunk. As the bamboo matures, each new shoot will emerge larger and develop into a twisting freak show that we all hope for. Translated (Chinese) stories and info about the Dai People's "King of all Bamboos" can be found by following this link: Dragon Bamboo. Re-imported from Xishuangbanna, Nov/2012 into USDA quarantine. Finally, in March/2015, the species was released to us from USDA quarantine (the 2013 US government shutdown is largely to blame for the release delay). Availability is, of course, extremely limited. We have about ten 3 gallon plants ready for sale for 2017. The single released specimen is now happily growing in our nursery field. It should be exciting to watch this species develop! This sub-species differs from the original form in that its lower internodes are straight, not slanted, zig-zag, or curved. There are no tortured-looking culms. The overall mature dimensions are the same as the original form and, because the culms are entirely straight, this form is high in demand in Yunnan (China) for construction material. Described as the largest bamboo in the world (largest culm diameter). Re-imported April/2012 into USDA quarantine - released to us in July/2013. New stock will be available in the summer of 2019. Jim Parker's giant bamboo in Hawaii. Huge and legendary. Species identity is in question. Very rare in the continental U.S.A., now being propagated at our nursery. Claims of 10” diameter, 120' tall culms in Kohala, Hawaii are exaggerated. This is, however, an extremely large-growing timber bamboo and massive 7" diameter 80' culms would not be unusual. Min USDA zone: 9b. Click to find your zone. The lower parts of the culms are sometimes solid. Drought tolerant. The most common and most useful bamboo in India. Many cultivars being distributed as this species (somewhere in the world) seems to always be in flower, and producing seed. The cultivar listed here was grown from seed collected in 1995 (India - Londoño/Lucas). It has developed into a highly-ornamental cultivar with small slender leaves and a willowy overall appearance. A pleasant surprise from a species that originated with minimal expectations. Grows up to 40' tall with 2.5" diameter culms in Florida. Minimum temp. 30 degrees F. Min USDA zone: 9b. Click to find your zone. A very large, bamboo from the foothills of the Himalayas in Tibet and Yunnan, where it grows at altitude of up to 5000 feet. The culms can reach a height of 75' tall and a diameter of 7". The leaves have a length of up to 18". One of the most cold-hardy species of the genus Dendrocalamus. Min USDA zone: 9b? Click to find your zone. Grows erect culms with pendulous tips. We're currently test-growing and will post photos and a detailed description by the end of 2014. 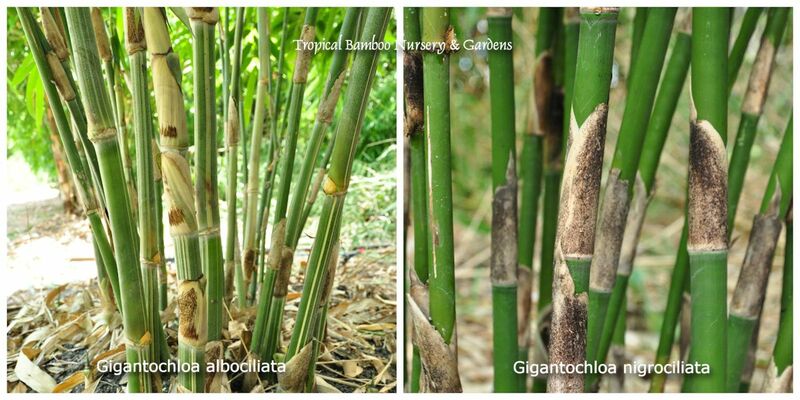 A massive bamboo species that resembles Dendrocalamus giganteus. Used for construction and for its edible shoots. New import. This bamboo is extremely rare and we should have limited propagules available by late 2016. From SW Yunnan, China, in the Xishuangbanna region (near Lijiang). We have only one test-specimen but expect that it will grow well in similar conditions as D.giganteus thrives in (South Florida). Vining bamboo that's similar to Dinochloa malayana, but larger. It originated as a seedling on Hainan Island (China) and was brought to South China Botanic Garden (Guangzhou). During a collection visit in 2013, I noticed it twisting and weaving its way through the canopy of several large trees. I had to have this jungle bamboo and sent a few samples to the USDA quarantine facility. The new culms are dark green covered with white powder which gives them a bluish look. Small clumping, mountain bamboo. Should not be grown in full-sun - especially in South Florida. Does well when planted in filtered sunlight. Will grow to about 8'-10' tall. Min USDA zone: 8b. Click to find your zone. One of the smaller-growing Gigantochloas. Beautiful white striation on the culms with light cilia (hair) on the culm sheaths. The fully grown culm often bends down to the ground, especially after rain. Large branches at base. smaller near tip. Gigantochloa nigrociliata is somewhat of a sister species and can be viewed by clicking this side-by-side comparison photo link. This Java native has large leaves and thick-walled culms which are densely hairy when young. Clump growth is fairly open, with culms erect or arching above. Tabasheer is a translucent white substance, composed mainly of silica and water with traces of lime and potash, obtained from within the culms, at the nodal joints, of some species of bamboo. It is especially sought after, and found, within the culms of this species. Tabasheer is claimed to provide a variety of health benefits and is used in traditional Indian and Chinese medicines.